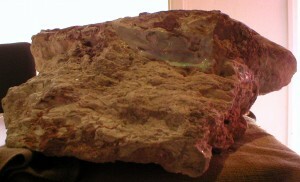 made of or from opal (Hydrated silica. SiO2·nH2O). Names of substances, including minerals, are generally given in the stative, as they are considered to be attributes. A piece of opal would be referred to with the singular jarākerel. More literally, the rock has an attribute: opal.